Instead of bituminising paper rolled roofing, new generation materials such as APP, SBS modified bitumen rolls or PVC plastic membranes were introduced in the construction of flat roofs. Large caldrons of tar disappeared from roofs. Gas burners and heat blowers were taken into use in installing roofing on flat roofs. Insulation materials such as cement fibrolite boards and shale ash boards that had been used before, were replaced by new and effective roof wools and roof foams. Layers of levelling mortar disappeared from flat roofs; instead, roofs are now attached to underlying structures with dowels. Flat roofs became lighter, more effective and the dependence of flat roofing works of the season decreased. Estonian builder is no longer alone today but integrated into the world with all materials and technologies available around him. Most of Estonian roofers have gathered under the Estonian Union of Roofers and Facade Makers (Eesti Katuse- ja Fassaadimeistrite Liit – EKFL), which is a full member of the IFD (International Federation for the Roofing Trade), the organisation uniting the world’s roofers. Members of the Estonian Union of Roofers and Facade Makers take part in various fairs in Estonia (Estbuild, the Building and Interior Fair in Tartu, and others), visit factories producing roofing materials and accessories in various countries like Finland, Russia and elsewhere (Katepal, Tehnonicol, …), participate in events organised by IFD (congresses, competitions and other events). In cooperation with the Estonian Union of Roofers and Facade Makers, we organise a vocational competition for young roofers – Baltroof. Baltroof 2012 took place in Mooste, Põlva County. In 2014, the competition was held in Ergal, Latvia. The most successful participants were granted the right to represent Estonian roofers in the youth world championships in Lucerne, Switzerland in November 2012, and in Bucharest, Romania in November 2014. Young Estonian roofers have done well at the competitions. Two third places and a special prize were achieved in Lucerne and one second place in Bucharest. The IFD, the organisation uniting roofers worldwide, is organising the competition “The World’s Best Roof” every two years. 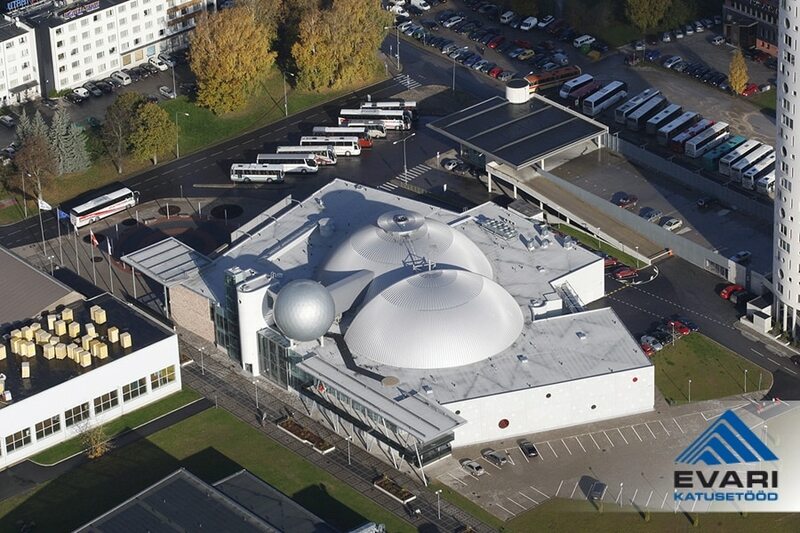 The best steel roof in the world in 2011 was the roof of Science Centre AHHAA at Sadama 1 in Tartu, with OÜ Evari Ehitus contributing to its construction.